It's a Thursday. - i've picked flowers today, i've sold flowers, and i've finished all the flower field jobs on my list. - I've also had time to do something i've been saying i'm going to do for weeks, - i've made an arrangement for the Seasonal Flower alliance and i've got 17 minutes to get it posted on the blog before dinner!. I'm not one to have girly crushes, (obviously Kylie, that goes without saying) - But for the last 18 months, i've been hanging on every word and photo of Erin Benzakin at Floret Flower farm. Erin is a Flower farmer in the USA, in the Skagit Valley, and I think she's (to drop my Surrey with a touch of South London accent and change to an American twang) Really Awesome. 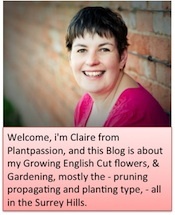 I've loved reading about the flowers that she's growing, and seeing the displays she creates, and each week she takes time out to do a floral display and invites others to show what's blooming in their corner of the world. So although my creation isn't quite up to her standards, I wanted to show what's in season on the slopes of the North Downs in Surrey. Pink Gladioli (unknown variety, a gift from my father in law) Nicotiana Lime Green, Dill, Feverfew, Zinnia Purple Prince, Dahlia Evelyne and Tu Tu, Daucus Dara, and Cosmos Versaille mix. Great new cut flower varieties at the Thompson and Morgan Trials field. On Monday I was delighted to be invited as one of a select few to a Bloggers day at the Thompson and Morgan Trials field near Ipswich. The traffic on the way there wasn't delightful, so I was shamefully late getting there, but luckily the T&M team led by Michael Perry (new product manager) were welcoming, and informative, and I quickly caught up on the information that i'd missed. The trials ground is a field and garden setting where they plant and test a lot of their huge range to see how it will cope in a normal garden. - They had a large colourful and scented area of pots and hanging baskets. Some garden borders, cut into a lawn, and then a raised bed area for their trials of vegetables. There was also an area of field which had been planted up with rows of bedding, cut flower plants and vegetables. Although they were bright and cheerful, and undoubtedly in good shape, the bedding plants didn't do it for me, - so here's some of the plants that caught my eye, for cutting flowers, and that i'll be trying at Hill top farm in coming years. The picture above shows a combination of yellow Bulplurum and Daucus Dara, (which i've been growing this year, and has all sold, ) and A tall mix of Ageratum - Timeless mixed. I'd found out about Ageratum - floss flower, via the Floret blog, and Louise Curley's book the cut flower patch, and had bought seeds, but missed the planting window, so watch out for that next year. There were plenty of bright colours in evidence, the foliage of Iresine Brilliant (top right) is a wonderful pink, and it looked plenty strong enough to be used as bouquet fillers - an experiment is in the offing next season I think. The Rudbeckia Hirta (top left) is unfortunately only offered as a mixed seed pack, but I thought this pinky coral colour worthy of a try, and if it's anything like the other annual (perennial in a mild year) rudbeckias, then you can grow more from the seeds if it's a success. The Alstroemeria is Indian Summer. - I've got several pale Alstroes, so thought this would be a lovely bright spark of colour besides my purples, pales and peaches. The Sunflower is Magic roundabout, and as 2015 is the year of the sunflower, It may be one to grow lots of. There were lighter shades in evidence, Italian White was the best light coloured sunflower, - there were rows of trials where they were trying to grow multiheaded varieties as hedges, with upturned faces. The 3 in the photo above were - Leucanthemum real charmer, which is a creamy buttermilk colour on strong stems. Antirrhinum Red white bicolour - growing strongly on the field to 60cm with no support, plus Nigella Delft Blue, A lovely Hispanica Nigella, with large seed heads, but a white flower with blue markings on it. Even though this had been direct sown in the trial bed and hadn't been thinned, the flowers had decent length stems. These are all on my must have list for next year, - which ones caught your eye? After a couple of manically busy weeks, and a few days away leaving Paula in charge (during which time she managed flowers for 3 weddings, and 2 florists and lots of bouquet orders - Thanks) i've indulged myself this week, with a couple of day trips. The first on Monday was with the Farm as the venue, but William and I took part in Emma Davies Flower photography workshop. When Emma held her 1st workshop of the year, back at the beginning of June, - I was planting frantically, so couldn't join in, but I promised myself that this time, i'd have a go, and William my 10 year old was keen to join in too. we started the morning learning about light. - This involved looking at the shadows on wooden eggs, and then we moved on to light needed for taking photos of objects and flowers. Everyone had different cameras, and was at different levels, but Emma took that in her stride, helped us all work out how to get the right settings for what we were trying to take pictures of, and before lunch we were all sent out to try her 7 "better photo techniques"
This involved us moving round flowers to find their best side. Getting down low as well as taking pictures from standing height. - Looking for leading "paths", - using the rule of 3rds, & focusing on one key flower. After a soup / sandwich lunch at Quaich in Horsley, we were ready to turn a bit more technical, and Emma encouraged us to "get off auto" - With the help of some lovely old props, we learnt about Apertures, and F- numbers. How to Blur backgrounds, how to work with wind, fast moving objects and low light levels, and then we were off to practice again. There was plenty of wildlife just waiting to be captured on "film" (I know we were all using digital, so not quite) and William loved this bee, while it was loving the Artichoke. and I found a another who was finding the Hyssop tasty. Then we finished up with some staged shoots in the polytunnel - brilliant for its diffused light. By this stage, William had wandered off, but when we downloaded the photos in the evening, in addition to the flowers, - there were quite a few staged "lego" shots! A fantastic day was had by all, It was lovely to Meet Clare, Janet and Suzanne, -thank you all for indulging and encouraging William. I'm looking forward to seeing the results of our first "homework" in the Facebook group for workshop "graduates".